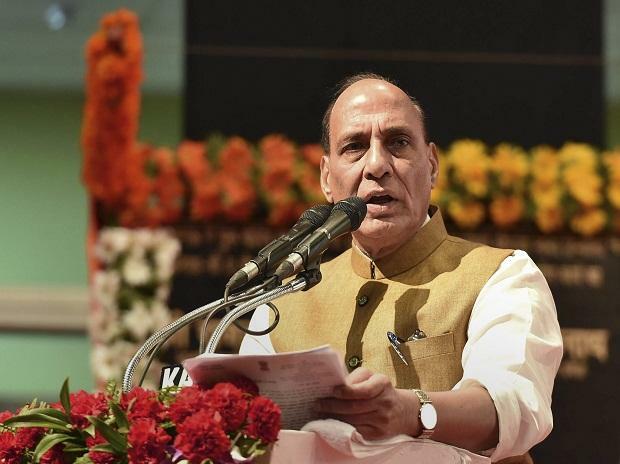 Union Home Minister Rajnath Singh on Saturday lambasted the Congress for promising abolition of sedition law in its election manifesto. He also compared the demand made by the opposition that the government come out with exact number of terrorists killed in the Balakot airstrikes, to vultures preying upon dead bodies. "Yudhveer (valiant soldiers) are not interested in counting bodies. It is the work of gidhveer (vultures), Singh said addressing a rally at Nawada. They (the Congress) say that they would do away with rashtra droh (sedition) law and then have the temerity to come to the people seeking votes. Can the people of the country vote for those who harbor such thoughts. Narendra Modi government is committed to crushing all sorts of anti-national activities. Far from abolition or dilution of the law we would strive towards making it more stringent, Singh told an election rally in Jamui. He canvassed in favour of LJP MP Chirag Paswan, who is contesting on Jamui (reserved seat), in presence of the latters father and his cabinet colleague Ram Vilas Paswan. The Congress seems to have forgotten the adulation the then Prime Minister Indira Gandhi had received when India defeated Pakistan in the 1971 war which led to the creation of Bangladesh. It is unable to stomach the reverence Modi is evoking as a result of displaying similar boldness of leadership, Singh said referring to the governments response to the Pulwama terror attack. On the economic front too, Modis leadership is doing India proud. As per a recent IMF report, the country has risen from ninth position among the comity of nations and reached the sixth rank. Opposition is wary of the blessings that the people are showering on the Prime Minister on account of his achievements, the former BJP president alleged. Singh also claimed that unlike the Congress governments, which had many ministers who had to go to jail for graft, there has been no taint of corruption on any member of the Union council of ministers headed by Atal Bihari Vajpayee in the past or Narendra Modi at present. There is simply no comparison between the Congress governments and the Modi regime. The Congress had been in power for most part since Independence and yet when we took over only 40 per cent of households in the country had toilets. In just five years, it has reached 98 per cent. Another example is construction of 1.30 crore houses under the Pradhan Mantri Awas Yojana in the last five years as against only 25 lakhs between 2008 to 2014 when the country was ruled by UPA, Singh asserted. At present we are the sixth largest economy in the world. Modis dynamic leadership would ensure that we jump to the third position within a decade, he added. Taking a swipe at the Mahagathbandhan which comprises parties like Lalu Prasads RJD, among others, Singh remarked now they have come up with this new formation which has leaders either in jail or out on bail.